Frozen Buffalo Trimmings that we export and supply are procured from the renowned sources of the market. 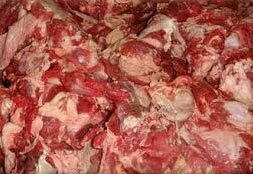 Our Frozen Buffalo Trimmings are obtained from the disease-free buffalo and are properly cleaned as well as processed before the freezing process. Furthermore, our Frozen Buffalo Trimmings are handled carefully before, during and after freezing so as to maintain the quality of the meat throughout the process. In addition, we provide Frozen Buffalo Trimmings in food-grade packing.